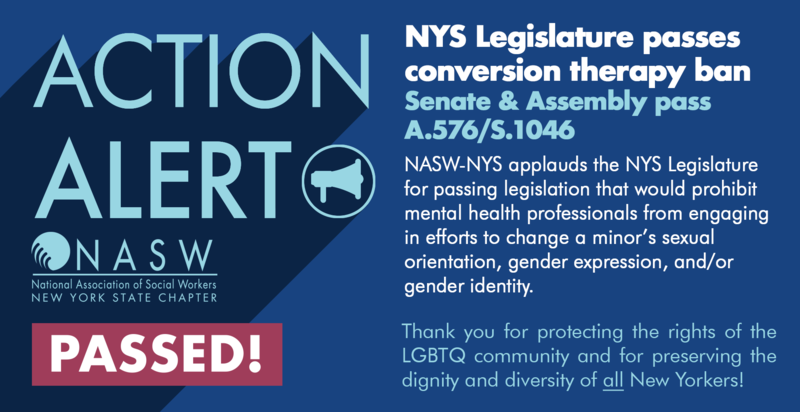 Tuesday, January 15, 2019, marked a historic day in Albany as the New York State Legislature voted to pass legislation A.576/S.1046 that will prohibit licensed mental health professionals from engaging in efforts to change a minor’s sexual orientation, gender expression, and/or gender identity, otherwise referred to as “conversion” or “reparative” therapy. For several years in a row, the bill had passed the NYS Assembly but faced strong opposition in the Senate. But as we sat in the Senate Chambers, watching a new group of Senators cast their vote on our bill and on Gender Expression Non-Discrimination Act (GENDA), the import of the moment could not be overstated. There were tears, cheers, and hugs, celebrating the end of two very long battles to ensure that gender non-conforming persons and those identifying as LGBTQ receive the same protections as gender-conforming persons. Finally! – New York has a statewide ban on conversion therapy. To many of our members, this legislative victory is a long time coming. NASW-NYS has long condemned the use of conversion therapy and for years, we continued to push for passage of legislation that would ban this dangerous and outdated practice. 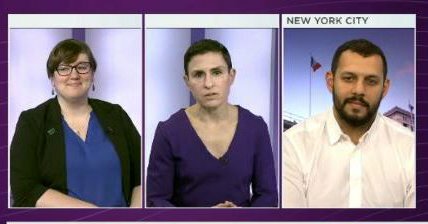 You have seen the action alerts asking you to call on your legislators to pass legislation that would ban this practice; calling for a statewide ban on conversion therapy was our primary focus at the 2018 Social Work Legislative Education and Advocacy Day; and we made multiple media appearances to raise awareness of the dangers of so-called “conversion therapy,” most recently this past December, alongside Mathew Shurka, chief strategist and co-founder of the Born Perfect campaign. Shurka also served as a consultant on “Boy Erased,” the critically acclaimed film based on the Garrard Conley memoir of the same name, that has brought nationwide attention to the frightening reality of conversion therapy. The philosophy behind reparative therapies are anathema to the NASW Code of Ethics, oppress people in the LGBTQ community, and represent a practice abhorred by the mental health profession. The practice has never been proven effective by any scientific or empirical evidence, in fact, every mainstream medical and mental health organization has repudiated the efficacy of conversion therapy, citing the growing evidence of harm and long-term detrimental consequences, including increased risk of depression, suicidal ideation, and substance abuse. But despite this, some practitioners continue to conduct conversion therapy and as such, the importance of this bill could not be underestimated. 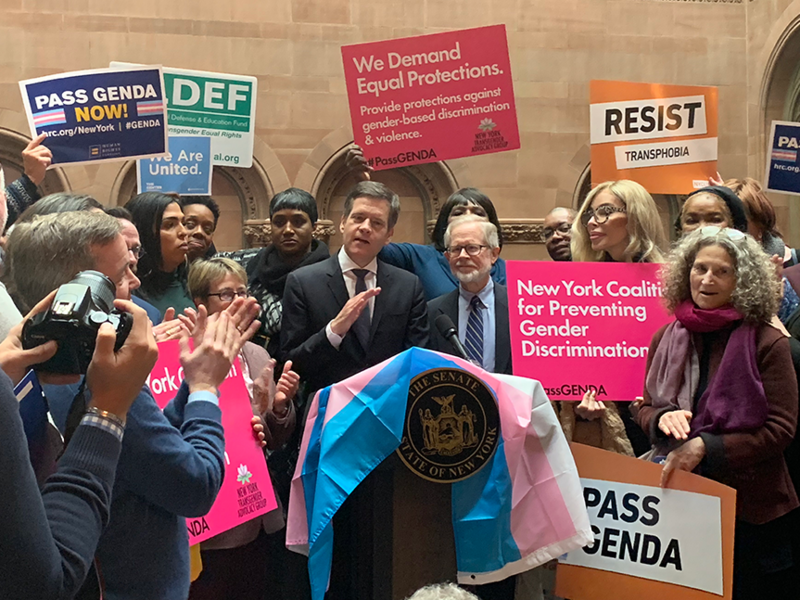 We applaud the NYS Legislature for passing this important legislation, specifically Senator Brad Hoylman (D-Manhattan) and Assemblymember Deborah Glick (D-Manhattan), our champions and bill sponsors in the Senate and the Assembly respectively, for their tireless effort to protect the rights of the LGBTQ community and to preserve the dignity and diversity of all New Yorkers. New York now joins 14 states and Washington D.C. that have passed laws prohibiting the use of conversion therapy on minors, and we hope the entire nation will follow suit. We would also like to thank our lobbyist Karin Carreau, MSW (Carreau Consulting) for her unwavering commitment to advocate on behalf of our profession and the people that we serve. A prime example of advocacy and social work at its best! We encourage our members to stay engaged in our legislative efforts by keeping an eye out for future action alerts. (Be sure to be subscribed to our emails and follow us on Facebook and Twitter!) Stay tuned — we have an exciting legislative session upon us and we are ready to work! 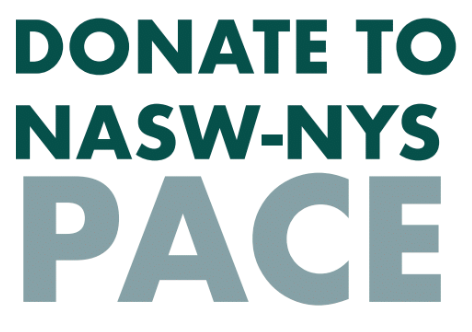 As we pause to celebrate this historic legislative milestone, please consider donating to the NASW-NYS Political Action for Candidate Election (PACE). PACE is the political action arm of the NASW at the federal and state level. Your support allows us to further our work by advancing our legislative priorities and your contribution to NASW-NYS PACE will support candidates who are social workers and social work friendly.